AUDIO/VIDEO PRODUCTION Whether you have some footage in the can or would like to start from scratch, our staff will produce an original, thought provoking message to achieve the maximum impact on its viewers. We can write and record voice overs, turn still photos into short commercials, edit video/audio, create flash/YouTube video and provide art direction and resources for more complex television productions. 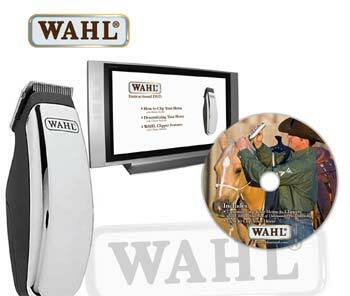 Challenge: Wahl Clipper Corp. needed to educate horse owners on proper clipping techniques and which Wahl clippers to use for specific purposes. A previous contractor dropped the ball and Wahl had footage in the can, but needed a final edited version in a hurry. Solution: HSMG cranked out the finished instructional video within two weeks of receiving the raw footage. A windy video shoot had made the audio quality quite poor, so we tweaked the audio track to minimize the damage. In addition, we organized product features for lower thirds, produced navigation menus and final disc graphics. 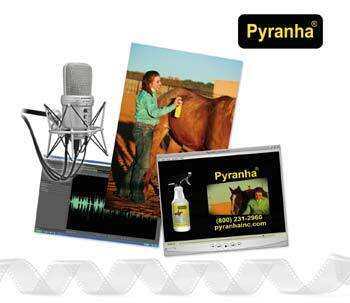 Challenge: Pyranha, the horse industry's trusted leader in insect control, wanted a new television commercial that would grab the attention of TV viewers. Solution: HSMG started by storyboarding and writing the spot, then scouted locations, lined up human and horse talent, secured the proper image releases, provided creative direction on shoot day and shepherded the editing to its final form. The result was one of the horse industry's most memorable commercials that kept the brand top of mind with viewers when it came time to go shopping. Bringing our media planning and internet expertise to the fore, we booked an aggressive run schedule on two networks and also integrated a web version of the video into the company's web site.